Today, Halloween 2009, my personal lifetime odometer flipped over to the 50,000 mile figure. It took me 14 years, six months, and 19 days of recorded running (since April 12th, 1995) to reach that mark. Over my lifetime of running thus far I have achieved a mathematical average of 9.4 miles per day, which includes vast stretches of non-running days due to various injuries. I guess I should shoot for 100k by my 40th birthday? Today's particular run was not much different than any of my other runs recently, of course. I took a run to the top of Green Mt. here in Boulder via Flagstaff Road and the Ranger trail. Despite getting ~30 inches of snow here earlier in the week, the sun was strong enough today to run shirtless as long as I wasn't in the shade. The Ranger trail had been superbly packed into a trench (likely by the crowd of Basic runners) that provided some surprisingly tacky footing, which made for an unexpectedly easy ascent and descent. It was just another glorious day in the mountains. Which is not meant to be a trivial statement. The funny thing about noting a landmark milestone such as this is that I find myself increasingly unconcerned with the number of miles I rack up in a given time period. Especially since moving to Boulder, where the mountain trails are particularly steep and rocky, keeping too close of an eye on the number of miles covered is fairly silly and even counterproductive. And yet, I do keep track. Maybe it has to do with my running roots in the hills of Nebraska where most of the dirt roads are surveyed on a perfect mile by mile grid, denoting the section lines. There, it was almost impossible to not notice how many miles I'd gone. Maybe it has to do with the classic standard that a "mile" is in the running world. Most American distance runners quantify their training volume with this arbitrary unit of length. Nevertheless, even given the assured amount of error in my total, I think it is still worth it to continue to maintain such records, if only for historical comparison, and to be able to--with some level of veracity--claim that I have run the equivalent of twice around the globe at its equator. Tonight I dashed out into the Halloween darkness for another easy seven miles in the moonlight to supplement this morning's 18. The legs felt splendid and clicked over effortlessly. And, when I was finished I was sure of at least one thing--even after 50,020 miles, I have yet to achieve redundancy. And I don't expect to anytime soon. Heading out the door this morning I wasn't really sure what I was going to run, only that I wanted to be out for a long time (four to six hours) and I wanted a couple of good climbs. With that in mind, I tucked four gels into my shorts, chugged a quart or so of water, and carried another 16oz of water in a handheld bottle. After the 20ish minute jog up to Chautauqua, I started with Green Mountain via Amphitheater, Saddle Rock, and Greenman. That climb has certainly become a default for me already. It's the most immediate, most fun way for me to get up high. Right up from the Gregory Canyon trailhead I could feel some nice pep in my legs. Running easily up steep, technical terrain is such a pleasure, definitely the most satisfying thing about building fitness. I had a fresh pair of New Balance 100s on my feet and the extra protection and responsiveness that the rock plate in those things offers is perfect for the terrain here in Boulder. Thirty-four minutes and 19 seconds and 2500 vertical feet later I was standing alone atop Green feeling fresh but a little chagrined at the lack of a view to the west. The Continental Divide was completely socked in. I still wasn't sure which way I wanted to go--down the West Ridge to Flagstaff Rd for the true "Backside Loop" or over to Bear Peak for some more vertical. I chose Bear. When in doubt, go higher. My legs felt lickety-split headed down to Bear Creek and then going up the West Ridge trail I still had a surprising amount of pop in my stride. For whatever reason, I usually really drag on this exceedingly moderate climb up the ridge, but not today. Even when I hit the last stretch up through the boulders and talus I was still feeling in control, except for the wind trying to knock me over, which it would attempt to do all day. Twenty-three minutes after crossing the creek I was on the summit of Bear Peak. On the summit of Bear, I noticed that a gel had fallen out of my pocket at some point--probably the downhill off Green--so I was going to be stretching the calories a bit today. Leaving the summit of Bear, I hadn't yet decided if I wanted to tag South Boulder Peak or not. The short distance between it and Bear always makes for a tough decision: it's trivial, so why do it? or, it's trivial, so why not do it? Today, I chose the latter, mostly because I enjoy the view from SoBo the most and because it's always hard to deny the trifecta of the 8ers here in Boulder if one has enough time. SoBo had the iciest footing of the day, but I made quick work of it and was still feeling great as I headed down Shadow Canyon. I love the upper stretches of this trail. There are very nice, reasonable switchbacks that, for some reason, remind me of the Barr Trail just below treeline. Soon enough, however, the track devolves into ever-steeper and bigger rock drop-offs really, and it always drags on longer than I think it should. Today it took me 15min flat to descend through the canyon and I emerged with my legs still feeling great even after two hours of running. From there I hooked up with the Old Mesa trail, which is notably rocky. It is very skinny, almost overgrown singletrack through a gorgeous little valley, but the tread is so full of embedded (not loose) rocks that I could barely lift my eyes off the ground to take in the views. But, after a few minutes it dumped me out in the gorgeously quixotic little hamlet of Eldorado Springs. It was my first visit to this little corner of the area and I loved it. Ramshackle houses, breathtaking setting, dirt streets--this is my kind of "town". I hadn't touched my water yet, and was holding off on hitting my first gel, but I figured if I was going to get some water this would be the place to do it. As if on cue, as I was running past a strange, Alamo-looking type of building, a couple of other runners called out my name. So I stopped to chat, there in the sunshine. They were doing the Backside loop in a much more traditional manner--having run down Flagstaff Road and through Walker and Eldorado Canyon already--and were refilling their Camelbaks at this weird little water-dispenser thingy in a wall. They said if I had a quarter, it would give me a gallon. I had no quarter, but they were kind enough to let me have one, even if I had no idea how I could drink a gallon of water right there on the spot. I elected to save the quarter for my then planned-for return-trip past the water dispenser. I wanted to get into Eldo, but I didn't want to pay. So I ran. All the way back to County Rd 67 and up the Fowler Trail. I knew there was a secret little shortcut trail to sneak up to Fowler more directly, but even with my eyes peeled I couldn't spot it. I didn't really want to go poking around in people's back yards if I didn't know where I was going. I love the Fowler trail. The views are just incredible. And the Eldorado Canyon trail was even more of a treat. The climbs on that trail are much more like what I am used to running in Colorado Springs. Reasonably steep, largely non-technical switchbacks that are runnable the whole way. And, the tread and line of the trail is perfect the whole way. Weaving in and out of woods, trending slightly up or down, expansive views into the canyon. Before the big drop down to South Boulder Creek and the Walker Ranch Loop I finally hit my first gel because I could finally start feeling my legs dragging a bit. Walker Ranch totally surprised me. I elected to go clockwise because at this point I was contemplating bailing on doing the full lollipop, but I still wanted to see as much of the trail as possible. South Boulder Creek is such an idyllic mountain stream up there. And the entire trail was more of the same reasonable up and down on very nice singletrack. 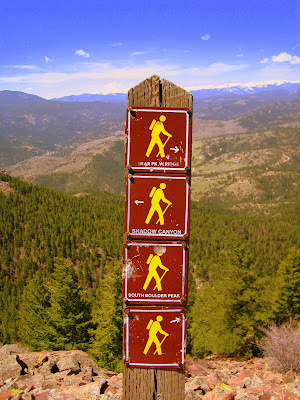 However, on the final climb up from the Creek to the Flagstaff Road trailhead I was hurting. Definitely dehydrated (still nursing a couple more mouthfuls in the bottle) and just generally feeling the grind of having run for nearly four hours. So, that's when Flagstaff Road decided to kick me in the teeth. Ouch. I was not expecting that climb to be so tough. It was only about 700' or so in the span of one and a half miles, but it freakin' hurt. I knew there was no way I was going to skip out on a second summit of Green for the day, though. What's another 500' of vertical? Plenty, that's all I can say. I finally made it, though, hit my final gel on top (the new Gingerbread GUs ain't half bad), and made the descent down Ranger. It took a tremendous amount of will power to convince myself that summiting Flagstaff was worthwhile, and I spent the descent motivated only by visions of the water fountain waiting for me in Eben G. Fine park. Of course, once I got there I knew I was only a slightly downhill 2.5 miles away from home and I didn't want to burn the energy to go the extra 50 yards to the fountain. Long runs in the mountains often have deleterious effects on my logic. Five hours thirty six minutes, 9000' of climbing (my watch said 9500', but my brain only calculated 8500' when adding up the big climbs, so I split the difference), five summits, and ~37 miles later, I was back at my doorstep. Lying in bed this morning I could already hear the rain falling outside my slightly open window. I have a bit of a head cold, so the sleeping hasn't been the best, and I was awake before my 6:00am alarm. Full tights and rain jacket today. Out the door and into the inky wet darkness. It was cold so I was sure it was snowing up high, which I was looking forward to; give me snow over 32F rain any day. Yesterday I'd sufficiently taxed the legs with a nice loop that involved summits of both Green Mountain and Bear Peak, so today I was looking for a nice relaxed run with more moderate climbing. When that is the case, I've found myself heading for Flagstaff Road, and that was the goal this morning. The road offers a welcoming predictable surface that would normally induce frustration. However, when the quads are heavy and the hips are tight it is very nice to be able to gain significant altitude by just pitter-pattering along with short, quick steps unhindered by the countless logs and boulders that typify most other routes up Green Mountain. 1) Snow is soft. The cushioning effects on downhills and on paved surfaces is immediately noticeable. In great enough depth, it completely smooths out all the rocks and roots on what would normally be an exceedingly technical trail. 2) Snow absorbs sound. Running alone through a snowy mountainscape has to be one of the most singularly silent experiences possible. When everything audible is cancelled out like that, the run inevitably takes on a certain kind of magic. This morning, the summit of Green was more symbolic than scenic. The heavy layer of clouds enveloping the mountains precluded seeing more than a few yards into the soupy air, but I reveled in having it all to myself, not seeing another soul out there. I've had the privilege of standing on the summit of Green 16 out of the past 18 days, and each day is different. That may sound cliche, but I believe a mountain summit to be one of those rare entities that works the same way in both a literal and a metaphorical sense. Each time, it offers an invaluable opportunity for perspective. On the descent back down the Ranger and Flagstaff trails (no paved road descents for me!) my crushed out New Balance 152s road flats offered surprising purchase on the just-right moisture content snow, and as soon as I stepped onto the Creek Path at Eben G. Fine Park the flakes disappeared, but the feeling still remained of having gotten away with something special. 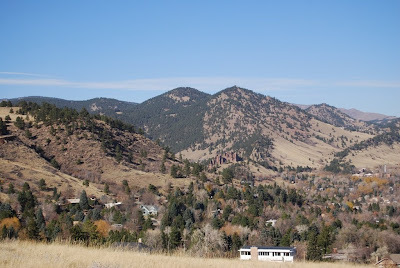 Driving into Boulder from the East, five peaks (well, more than that, but all of these have connected trails) provide the meat of the backdrop of town: 8549' South Boulder Peak, 8461' Bear Peak, 8144' Green Mountain, 7000' Flagstaff Mountain, and 6863' Mount Sanitas. Seeing as they are connected, it presents a tantalizing and obvious traverse. This weekend I completed the first of what I expect will become a nearly weekly outing (hmmm...we'll see once things get truly snowy and icy). I jogged the less than 20 minutes from my house up to the start of the Mesa trail at Chautauqua Park and could tell that the previous day's flat and easy 90 minute run had did my legs good. The Mesa is nice. It is such a classic Boulder trail with its accessibility, views of the Flatirons, and ubiquitous hikers of all stripes, often with dogs in tow. I was happy for my short-sleeved shirt as the trail bops in and out of drainages mostly in the trees, but could tell that it was going to warm up to be a glorious autumn day. 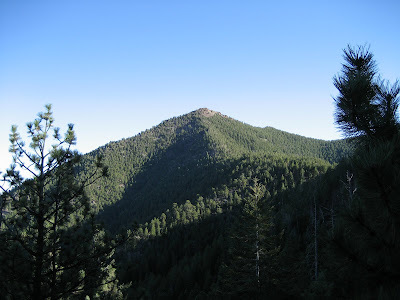 The Mesa Trail is only "flat" in comparison to the craggy peaks whose bases it winds along. The highest point is ~6600' (compared to the 5300' that my house sits at) and there are several 100-200' rollers to put some sting in the legs. I cut down Big Bluestem to make the nearly 1000' descent to the South Mesa Trailhead on Highway 170 and started the traverse from there having already run 1:17. Leaving South Mesa TH and climbing up the Towhee trail, it is easy to think that one is running "uphill". That all changes when Shadow Canyon is reached. In anticipation of the effort, I took off my shirt at the mouth of the canyon and headed up. 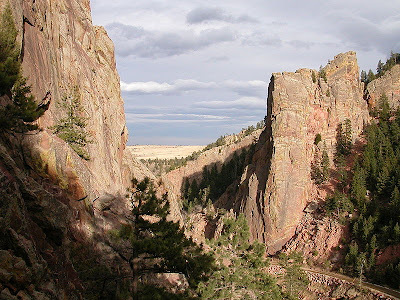 This trail is yet another wench of a rugged climb that Boulder has to offer. Apparently these mountains don't really know any other. This stretch of trail is only allegedly 1.1 or 1.2 miles long and I did it in 22:50, not killing it, not feeling great, but definitely not slacking either. It gains 1700' in that 1.2 miles which is absurd now that I think about it. The Incline in Manitou climbs 2000' in a single mile, so for anyone who's been on that, that gives you an idea of how crazy Shadow is. But, after seeing it for the first time today, it's definitely possible to nail this thing on a day when I'm feeling good and I have dialed in some of the rock step-up footwork sequences. Come to think of it, I would bet that, time-wise, this and the Incline are pretty comparable. I mean, sub-20 on this stretch would be nails (as it is on the Incline). Anyways, I got to the saddle and was righteously greeted with a horizon-wide view of the snowy Continental Divide. 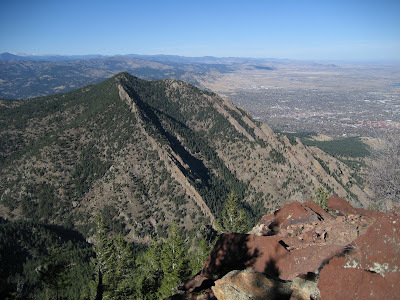 But, from there I had another ~300' and 5min of vertical to the top of South Boulder Peak. The final forty seconds or so of this is a scramble on boulders, so that's kind of annoying, but I do really like the views from over there, looking down into Eldorado Canyon. The run down and over and up to Bear Peak was actually quite nice. I'm getting better at this stuff. After running up Shadow I was thinking, "Damn, I just want some real trails with actual switchbacks and some actual tread instead of these glorified rock staircases." But, on the way over to Bear, I decided that it's actually 100% fine. This seems to be true mountain running; I think it's good to have the opportunity to get as proficient as possible on really technical up- and down-hills where you have to mix a running cadence with occasional huge step-ups and then get right back into the cadence and then learn how to rock-hop on the way down. It's actually a huge blast when the trails/rocks aren't covered in ice and snow (they weren't today). And, since I'm gonna be in Boulder for a while, I think it's worth it to adapt to the terrain and get really good at it. Plus, I appreciate the more natural and wild aesthetic of running a rough trail to the top of a mountain and then having to scramble over boulders the last minute or two to gain the true summit. It is how it should be, really. Anyways, I hit a gel on top of Bear and actually felt pretty solid on the descent down to Bear Creek. The top of Green was a bit of a dissappointment with a bunch of people clogging up the summit rock so I didn't even feel like elbowing my way up there to get a good look at the Divide. Not that I hadn't already had at least two world-class, people-free views of the high mountains so far. Going down Ranger and then over and down Flagstaff I just tried to keep the legs feeling good and actually pounded some pretty good descents. Earlier in the morning I had contemplated forgetting about Sanitas mostly because it's on the other side of the Creek Path (my route home) and also because it's just such a heinous grunt. However, I got to thinking about climbs late in various races and decided that a 1300' ascent in 1.2 miles was exactly what I needed to finish off the day's endeavor. So, at Eben G. Fine Park I chugged a much-needed bottle of water and refilled, ate a gel, shuffled over Red Rocks and then got to work on Sanitas. It's a good little mountain, that's for sure. Tons of log and rock steps but also a few actual flattish sections, too. Problem is, because of the beautiful day, it was crawling with folks and I was mostly a salty, slobbering mess at this point, so I felt a little self-conscious about the effort it was taking to just keep moving. Three days before Leadville I had jogged over to Sanitas and ran easily to the summit right at 19min flat, so I was really hoping to groan my way under 20min today on my untapered, not-as-fit, tired legs. I didn't quite make it, but hit the top 2h38min after leaving the South Mesa Trailhead. At the top there was the usual mess of humanity with visors and dogs and sunglasses and cell phones, so I mostly just caught my breath and jogged down the mountain, which was actually a lot more fun than I remember it being that Wednesday before Leadville. On the way back down to the trailhead I elected to take the Dakota Ridge singletrack instead of the Valley trail and right at the bottom Jeff Valliere caught up to say hello but was just out for a short hike with his wife so he soon turned back. Which was fine with me, because I was pretty worked and was super-psyched to get back to the top of Red Rocks because it was all (slightly) downhill from there back to the house. It was a good ache, though, one that I haven't gotten to experience in a couple of months. It's always good to get to the end of a long hard effort like that and still feel pretty solid. I took a soak in Boulder Creek afterwards, but the water was so cold that I could only stand it for two minutes because my toes had gone numb and the rest of my legs were hurting so much from the cold I was gettting sick to my stomach. I think I've gotten a bit soft since this summer, but hopefully I knocked a little inflammation down. All in all, a unique day in the mountains. Boulder is a city. Most of us live in cities. I'm finally becoming reaccustomed to doing so. 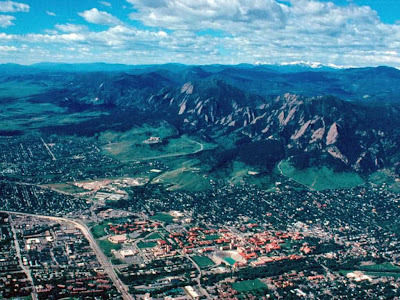 Boulder, in many ways, however, is not a lot like other cities. 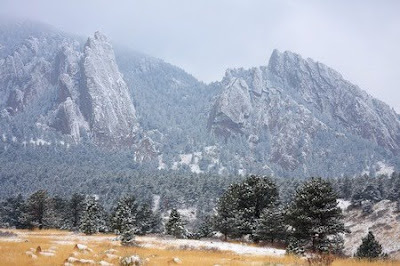 It is the meeting point of the mountains and the plains, so its mountains--the iconic Flatirons, Green Mountain, Bear Peak--carry a certain abruptness, a certain drama that make them especially compelling. Nevertheless, I spent most of the first month of my residence here dwelling on the fact that Green and Bear aren't Pikes. That Boulder isn't Manitou or Colorado Springs. Pikes Peak is the ultimate in dramatic topography that the Rocky Mountains has to offer: 8000' of vertical--Kansas-esque plains, and then BOOM, alpine summit. And, also, for whatever reason, it seems the human spirit tends to gravitate towards the familiar (i.e. the Pikes Peak region, for me). However, the past week has represented a turning point in how I feel in relation to my new surroundings. I've been taking some down-time since Leadville, but this week the running has began again in earnest. From the upstairs graduate student computer lab in CU's Guggenheim Hall, there is an in-your-face view of Green Mountain. I can run to its trailhead from my doorstep in less than 20 minutes, a perfect amount of warm-up. From Guggenheim, Green Mountain seems so close as to be able to reach out the window and touch it, rearrange its features. Instead, this week I've been letting it rearrange me. I've been up Green each of the last six mornings. It has been good to finally go about learning the idiosyncrasies of the mountains most immediate to my current existence. My preferred route up Green is so rugged, so varied, so challenging, that I don't anticipate tiring of what it has to offer, and I relish the opportunity to learn every stone and perfect every foot placement on its ascent. Because, for now, Boulder is definitely home.